Asheville native Sarah Addison Allen delights in life’s mysteries and uses those true stories to inspire her fantastic fiction. Bestselling author Sarah Addison Allen was renovating the Asheville home that she inherited from her great-aunt Charlotte when she pulled an old bureau away from the wall and found one of Charlotte’s favorite bracelets. “It was like she left it for me,” Allen says. 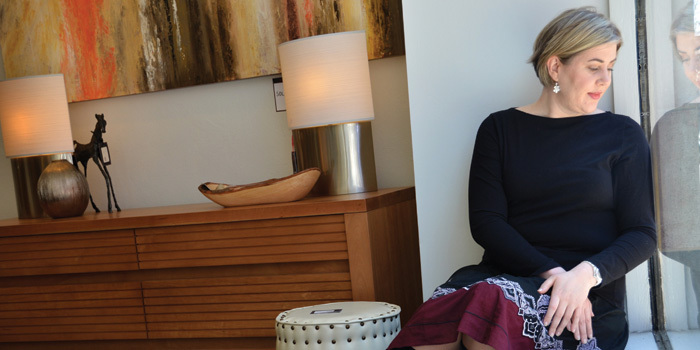 For a writer who allows the magic of discovery to connect characters to the past and each other in her four carefully crafted novels, the find affirmed her faith in serendipity. Allen, 39, sets her newest novel, The Peach Keeper, in a small mountain town reminiscent of Asheville, a place she never plans to leave. “Asheville is like this rubber band, only letting me venture out so far before I get pulled back,” she says. Her parents, now divorced, still live in the area. Her mother, Louise, is a petite redhead, friendly and energetic, who shocked Allen when she got her nose pierced at age 50. In contrast, Allen is an introvert, tall and blond, who loves sameness and familiarity. She draws daily comfort and inspiration from gazing through the windows of her home office that looks out on Spivey Mountain. Themes of place, family, and returning home wind through Allen’s novels as characters reckon with fraught histories to discover what they want in life. Allen’s schoolteachers placed high expectations on her writing because of her well-known journalist father, Zack Allen, who worked for the Asheville Citizen-Times. A ninth-grade teacher bolstered Allen’s confidence when she recognized Allen’s gift for fiction. After graduating from the University of North Carolina at Asheville with a degree in literature, however, Allen found the writing life to be about rejection. At best, it was confusing. When she did publish a Harlequin romance, Tried and True, under the pen name Katie Gallagher, editors told her it fell into the comic romance category. Written in just four months and sent to two-dozen agents for consideration, Garden Spells was Allen’s last attempt, after four years of focused writing effort, to break into publishing. She enrolled in a medical transcription course as a backup. An agent accepted the novel, sold it, and Allen quit the transcription course. She calls the success a combination of luck meeting hard work, but the timing was serendipitous. While reading at Quail Ridge Books in Raleigh, she got the call that Garden Spells made The New York Times’s best-seller list. She keeps in contact with fans through her website, where her sense of humor and playfulness come out. She also reveals personal longings and aspirations that she writes into the lives of her characters — such as always wanting a pink streak in her hair, something Julia Winterson, from her third novel, The Girl Who Chased the Moon, gets to flaunt. Allen doesn’t plan out her novels and often writes from multiple points of view as her characters and stories demand. The Peach Keeper by Sarah Addison Allen. Bantam Books. 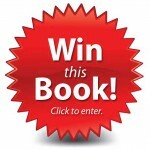 2011, 288 pages, hardback, $25. 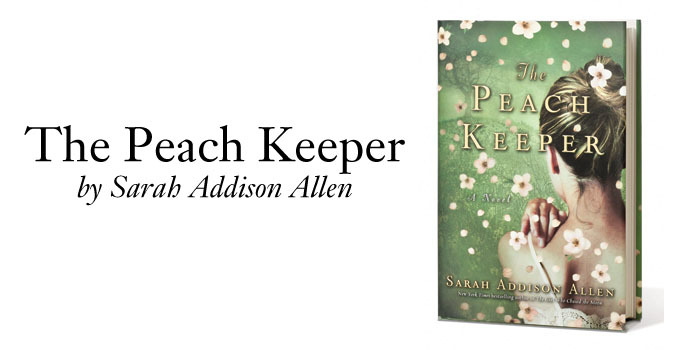 In Sarah Addison Allen’s newest novel, The Peach Keeper, past and present relationships become as tangled as the roots of a peach tree, complicated by the long-buried secrets of Walls of Water, a small mountain city similar to Asheville. Willa, who returned to her hometown to nurse her father until his death, now owns a sporting-goods store and coffee shop. In contrast, Paxton, who graduated high school with Willa, never left Walls of Water, or even her parents’ home. Paxton has one role: to uphold the family name and make her parents proud. Willa and Paxton aren’t friends, but they’re connected through their grandmothers, who started the Women’s Society Club 75 years ago. Allen creates a symmetrical scaffold for her characters and the plot, which not only helps readers keep track of who is who, but also emphasizes the class divisions that, if left unchallenged, create assumptions as dense as mountain fog. Both Willa and Paxton struggle with decisions about their love interests — former classmates who left town and returned. Laced with the magical realism that Allen’s readers adore, The Peach Keeper emphasizes the importance of shared histories and honest relationships. Janet Hurley is a freelance writer and founding director of True Ink, which provides creative programming for young writers. She lives in Asheville with her husband and two children.